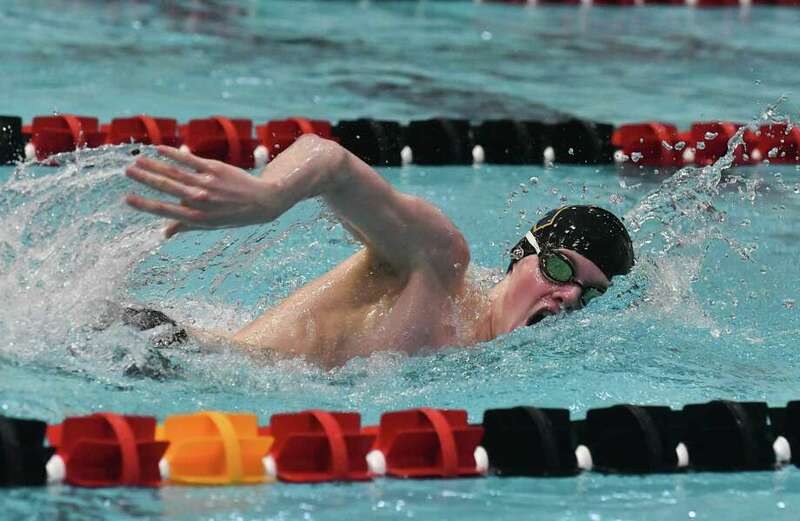 MIDDLETOWN — Depth once again catapulted the Greenwich High School boys swimming team to the head of the class. With 21 swimmers competing in Wednesday’s CIAC Class LL Championships and a head start in team points due to the success of their divers in last week’s finals, the Cardinals entered the swimming portion of the state meet primed to continue their reign of supremacy. As the meet progressed, it was crystal clear the Cardinals were going to add another class title to their collection. Showcasing its superior depth, Greenwich captured its sixth straight CIAC Class LL title, amassing 833 team points at Wesleyan University. Fairfield Prep, which was powered by record-setting swims by senior Oliver Rus, placed second in the team standings with a score of 643.5, followed by Staples (593). Ridgefield, which received two individual record-setting performances from senior standout Kieran Smith, was fourth with a team score of 514. Glastonbury finished fifth (446.5) and Norwalk/McMahon posted a sixth-place finish (278.5) — its best showing at the meet in recent memory. The competition further illustrated the improvement Greenwich has made since the early part of the season. The Cardinals were defeated by Ridgefield, Fairfield Prep and Staples in dual meets during the regular season. Greenwich, which received a first-place finish in the 200-yard individual medley from sophomore Stephan Todorovic, may have put itself in good position to contend for its sixth consecutive State Open, since the Class LL finals was a qualifier for Saturday’s Open at Yale University. Smith of Ridgefield had the meet’s first individual victory in record-setting fashion. He won the Class LL 200-yard freestyle title with a state, Class LL and pool record time of 1:35.18. He broke his previous state record in the event of 1:37.28, which he set last season. Freshman Connor Hunt of Ridgefield was the 200 freestyle runner-up (1:43.09), followed by Staples senior Nicholas Ortega (1:43.26) and Greenwich sophomore Charlie Clark (1:44.10). Norwalk/McMahon sophomore Henry Valazquez was seventh in 1:46.84. The 500-yard freestyle saw Smith successfully defend his title. Leading from the start, then increasing his advantage during the third lap, Smith touched the wall first in a state, Class LL and pool-record time of 4:21.37. Hunt also placed second in the 500 freestyle (4:37.96), while Ortega of Staples was third (4:42.02) and Greenwich’s Schultz took fifth (4:47.25). In one of the meet’s closest races, Todorovic edged Ridgefield senior Andrew Bornstein for the first-place medal in the 200 individual medley. Tordorovic, who posted a time of 1:52.71, was neck-and-neck with Bornstein (1:52.77) in the final lap. In the 50 freestyle, Fairfield Prep’s Rus placed first in a Class LL record time of 20.24 seconds. His teammate, Liam Colleran, was second in 21.82 and Ridgefield’s William Bryant finished third (21.83). Tyler Cusano from Hamden placed fourth, followed by Josiah Tarrant of Staples and Patrick King from Greenwich. Rus broke a state and meet record in winning the 100 breaststroke championship in 54.25. Greenwich held a 519-361.5 lead over its closest competitor, Fairfield Prep, in the team standings following the 100 freestyle. The Cardinals scored a whopping 92 points in the event, behind Clark’s second place finish (47.28) and a 6-7-8 showing from Mac Baxter, Patrick King and Segundo Rienhardt. McNab was the 100 freestyle champion in 47.12. Feldman earned the first-place medal in the 100 butterfly (49.62), followed by Todorovic (51.55). The meet ended with Greenwich’s foursome of Baxter, Rienhardt, Todorovic and Clark touching the wall first in the 400 freestyle relay in 3:11.88, resulting in 60 more points. Team scores: 1. Greenwich 833, 2. Fairfield Prep 643.5, 3. Staples 593, 4. Ridgefield 514, 5. Glastonbury 446.5, 6. Norwalk/McMahon 278.5, 7. Newtown 270.5, 8. Southington 253, 9. Cheshire 219, 10. Westhill/Stamford 212, 11. Manchester 135, 12. Hamden 129, 13. Trumbull 102, 14. Platt/Maloney 100, 15. Warde/Ludlowe 91.5, 16. East Hartford 89, 17. Bristol Eastern/Bristol Central 77, 18. Branford/Guilford 72.5, 19. NFA 63, 20. Danbury 46, 21. West Haven 44, 22. Crosby/Waterbury Career 32. 200 medley relay: 1. Fairfield Prep 1:32.78; 2. Ridgefield 1:33.78; 3. Staples 1:36.95; 4. Greenwich 1:38.22; 5. Newtown 1:39.59; 6. Glastonbury 1:39.66; 200 freestyle: 1. Kieran Smith (Ridgefield) 1:35.18 (state record); 2. Connor Hunt (Ridgefield) 1:43.09; 3. Nicholas Ortega (Staples) 1:43.26; 4. Charles Clark (Greenwich) 1:44.10; 5. Christopher Walker (Glastonbury) 1:44.97; 6. Kirk Schultz (Greenwich) 1:45.16; 200 IM: 1. Stephan Todorovic (Greenwich) 1:52.71; 2. Andrew Bornstein (Ridgefield) 1:52.77; 3. Richard Nolan (Fairfield Prep) 1:54.69; 4. McAllistar Milne (Glastonbury) 1:55.38; 5. John McNab (Staples) 1:56.09; 6. Ryan Lynch (Greenwich) 1:56.85; 50 freestyle: 1. Oliver Rus (Fairfield Prep) 20.24 (Classs LL record); 2. Liam Colleran (Fairfield Prep) 21.82; 3. William Bryant (Ridgefield) 21.83; 4. Tyler Cusano (Hamden) 21.98; 5. Josiah Tarrant (Staples) 22.01; 6. Patrick King (Greenwich) 22.04; 100 butterfly: 1. Ben Feldman (Westhill/Stamford) 49.62; 2. Stephan Todorovic (Greenwich) 51.55; 3. Ben Brewer (Cheshire) 52.00; 4. Colin Zorger (Manchester) 52.50; 5. Stanislav Yarmoussik (Fairfield Prep) 52.75; 6. James Pascale (Greenwich) 52.79; 100 freestyle: 1. John McNab (Staples) 47.12; 2. (tie) Christopher Walker (Glastonbury) and Charles Clark (Greenwich) 47.28; 4. Tyler Cusano (Hamden) 47.46; 5. William Duffy (Fairfield Prep) 47.66; 6. Mackenzie Baxter (Greenwich) 48.23; 500 freestyle: 1. Kieran Smith (Ridgefield) 4:21.37 (state record); 2. Connor Hunt (Ridgefield) 4:37.96; 3. Nicolas Ortega (Staples) 4:42.02; 4. Kirk Schultz (Greenwich) 4:47.25; 5. McAllistar Milne (Glastonbury) 4:47.61; 6. Brody BIebel (Fairfield Prep) 4:48.35; 200 freestyle relay: 1. Fairfield Prep 1:24.61; 2. Ridgefield 1:26.54; 3. Greenwich 1:27.28; 4. Staples 1:27.73; 5. Glastonbury 1:29.73; 6. Norwalk/McMahon 1:30.87; 100 backstroke: 1. Liam Colleran (Fairfield Prep) 51.22; 2. Kevin Tierney (Glastonbury) 53.64; 3. Tyler Heidgerd (Southington) 53.90; 4. Ethan Keyes (Fairfield Prep) 54.01; 5. Scott Adler (Staples) 54.20; 6. Austin Twiss (Staples) 54.27; 100 breaststroke: 1. Oliver Rus (Fairfield Prep) 54.25 (Class LL record); 2. Ben Feldman (Westhill/Stamford) 55.61; 3. Andrew Bornstein (Ridgefield) 56.68; 4. Dashiell Hunter (Staples) 58.24; 5. Jacob West (Staples) 58.54; 6. Thomas Lewis (Greenwich) 58.66; 400 freestyle relay: 1. Greenwich 3:11.88; 2. Staples 3:14.92; 3. Glastonbury 3:15.48; 4. Ridgefield 3:17.18; 5. Fairfield Prep 3:18.88; 6. Norwalk/McMahon 3:18.89.